1. Hooray for threaded commenting! 2. OH MY WORD, I accomplished something technical! 3. I'll need you to tell me if Disqus is annoying in any capacity. If it makes things weird, I'll kick it to the curb. 1. Anderson Cooper gets the giggles on-air. The puns sprinkled (sorry) throughout the news story are downright painful, but the way Anderson dissolves into laughter at about 2:30 in makes me giggle right along with him. 2. One of the most stunning songs ever written, pretty much any version/cover will stop me in my tracks for a listen. This one, though, is one of my very favorites. Gorgeous throughout, but from about 4:00 on...serious goosebumps. 3. From things I enjoy to a regrettable grocery store purchase. I'll admit to being a sucker for fascinating breakfast cereals. Mark pretends to be slightly irritated by this. ("Why don't you just buy the kids some Cheerios? "), but he's often the one consuming large bowls of the colorful varieties for a bedtime snack. Claims he's just trying to get it out of the house, but I know better. Anyway, I picked up a box of Pebbles Boulders one day, and we are not fans. 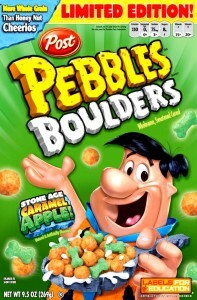 There's something about caramel apple flavor that doesn't translate well to cereal. My children, who are not exactly picky breakfast connoisseurs, won't even touch the stuff. "Too sweet! ", Maya proclaimed. Note to the people at Post: If this particular child has deemed your product 'too sweet', you are going to want to re-think some things, and also watch the skies for flying pigs. 4. And from unpleasant to disturbing, I give you this website for a product we saw advertised on television not long ago. I pass no judgment on the product itself. It is perhaps of great relief to people with certain skin conditions, and that's lovely. However...Toe Juice? Really? Those two words together put my gag reflex into overdrive. It's available for purchase at your local Walgreens, however, if this stuff tickles your fancy as much as jokes about urination tickle Anderson's.